The university’s progress and its scientific and intellectual evolution have reflected positively on all scientific and academic forums and formations within our university. 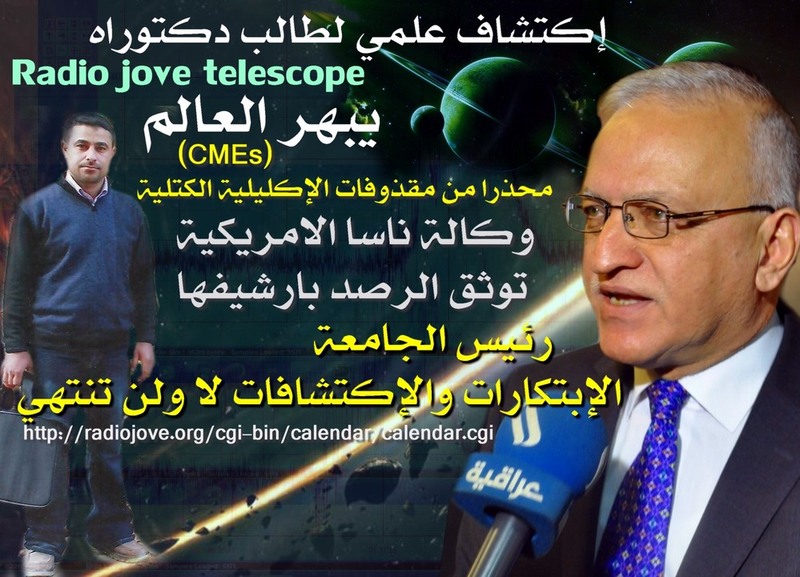 Many scientific efforts were exerted by the university’s members such as the recent achievement reached at by a scientific staff consisted of the following researchers: assistant teacher Mohammed Ajeel Mohammed, an instructor at the department of administrative affairs at the presidency of University of Baghdad, PhD student at the faculty of science, department of astronomy, Prof. Dr. Kamal Mohammed Aboud, an instructor at the faculty of science, department of astronomy, assistant Prof. Dr. Amjad Abdul Nabi Al-Sawad, Associate Director General of the department of missions at the ministry headquarters who monitored a radioactivity pulse of the sun on 16/03/2016, (type ii) via a radio jove telescope at the faculty of science which is considered as one of the types of radio pulses emitted from the sun within its radio spectrum. The recording of such an event is considered very important for it occurs rarely due to blocking of many frequencies of this type by layers of atmosphere, in addition to the fact that it gives a warning about the presence of coronal mass ejecta (CMEs) which in turn sends solar active objects (SEPs) that affect communication, spacecraft and earth’ atmosphere and weather. Prof. Dr. Alaa Abdul Hussein Abdul Rasul, president of University of Baghdad met this scientific team numerous times at the college of science and in his office, urging students and professors for more outstanding scientific activities, especially after opening five new scientific labs that led to this discovery during a short period, as well as calling for supporting researchers through providing laboratory supplies that will develop them when performing their researches in line with the tremendous intellectual and scientific developments taking place all over the world. The website team and TV university channel office met the researcher “Mohammad Ajeel” and documented his meeting with the rector as well as the astronomical observatories at the university with photos.